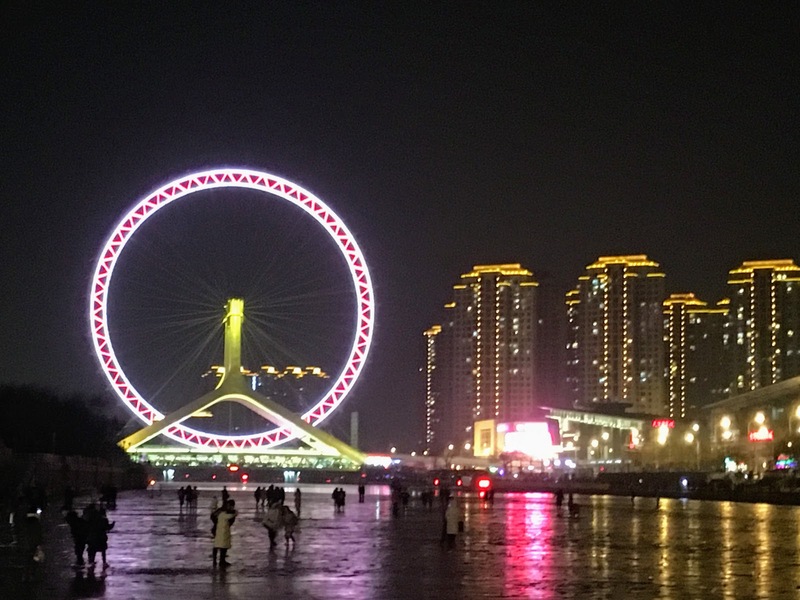 Desperately Seeking Adventure: 48 Hours: Tianjin, China! 2018's eve gave me the key to unlock three days off from teaching, making my way to Beijing South Railway Station had to be done, that Tianjin high speed train wasn't going to wait for me! Choosing Beijing's little sister seemed like the right thing to do, only 30 minutes away from BJ left me with enough time to arrive before midnight on the 30th of January 2017. Get it, T! 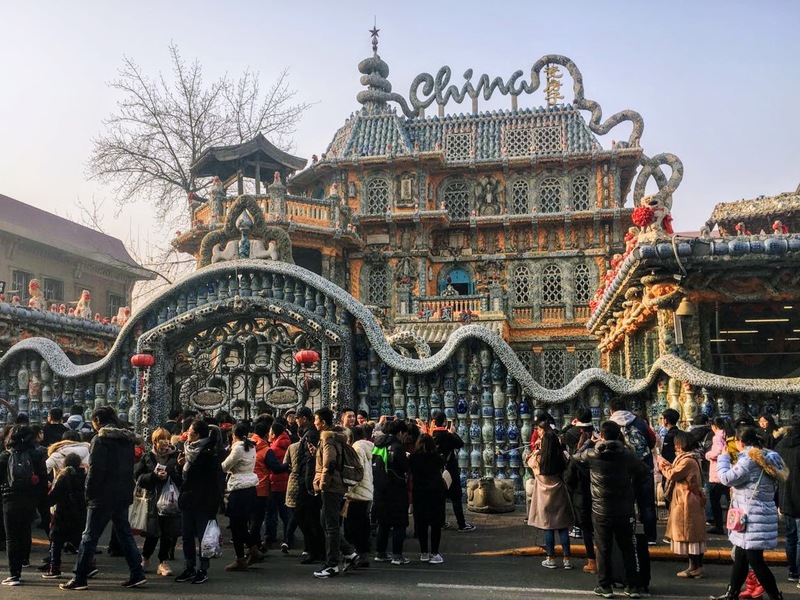 Being a port city Tianjin has had a colourful past, my first port of call during that New Year's weekend trip was to the 'Five Great Avenues'. Built by British, French, German and Italian settlers, this international concession was leased to those western counterparts during the early 19th century, maybe the motive was money? Regardless of any remnants of its shady past I was transported home for even a brief moment, some of the buildings oozed a certain British style without a doubt! The pollution that morning was no joke, thankfully my up close and personal photos weren't ruined by the low visibility, sure with a breezy forecast a blue sky decided to make an appearance. It was funny to see the street signs only detailing the Chinese pinyin, usually a 'Chinglish' name for the street stands below the original text, was it in defiance due to the colonial reminders seen within Wu Da Dao? Well, I could read the signs T! I had already been in Tianjin since the previous night, after clocking out of my kindergarten campus I made my way to the Beijing South Railway Station via Line 15 and Line 14 of Beijing's vast subway network. The New Year's travel rush for the weekend ahead packed the underground trains but Beijing knows how to handle that! Arriving into Tianjin Railway Station was no stress, finding myself on the wrong side of the station, the location of the exit had other plans for me. Scanning a MoBike I peddled to my hotel during the twilight, it was so peaceful for a huge city and that felt so refreshing. Fast forwarding to that colonial wonder I could feel the same relaxed pace even though it was a long weekend, taking my time I saw the regal buildings without fuss, well minimal because it wouldn't be China without a little bit of 'are you serious?' Tianjin didn't give me any reason to rush around, so I took my time during that morning, it was just after the morning because I wanted to sleep in. Foolish people were getting in my photo space and it was too damn cold to wait for their petty photos to be taken, scanning another MoBike I swerved between those passing cars and cursed at those bikers who looked like they were 'driving miss daisy!' Heading for the Porecalin House was the aim, yes a house ironically made from China in China, the middle kingdom is always full of surprises. Over the amount of selfie takers, getting into the Poreclain House took some patience that was almost lost but I always keep my 'ish together. Getting inside the Poreclain House showed me something that reminded me of Barcelona's Guadi offerings, that China residence could have well be a Chinese made love story during a possible Gaudi trip to Tianjin, China? Serving elements of 'Parc Guell' on a pint-sized and chaotic scale it could have been a Chinese Catalan offspring?! Apprently my Chinese was amazing but those selfies were not! Most riverside cities in China have seen prosperity in more ways than one, Tianjin's own ocean river impressed me with its frozen frame, it felt so cold but the freshness blew those cobwebs away for sure! Boasting its own port that's home to Royal Caribbean Internationals cruise liners changes the game for China because now Shanghai isn't the only port city giant in China, no! I appreciated the riverside views because unlike Jinwan Square's architechure it looked like the real thing along the Hai He riverfront, the Chinese really need to see that reconstructed old buildings only work at Dudley's Black Country Living Museum, leave that remade nastiness behind because it's just tacky, some might call my tone bitter but I feel its just me being authentic with what sights I did see along my Tianjin travels. 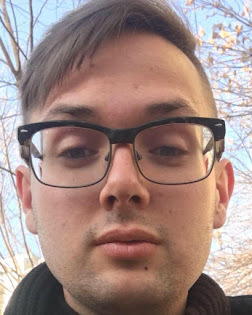 Soju corrupted me that afternoon, no open container law had me shamelessly sipping to view people's disgusted looks, no laws were broken T! MUSE sorted for my pre-pre NYE night! Slay! Feeling rather tender the only cure for my drunken mistakes was a massive KFC to sort it all out, thankful my hotel was just a few paces away from one! Stomach and hangover tended to I was on the look out for Tianjin's ancient culture street, a usual sight that I usually avoid like the plague but since returning to China I want to give every opportunity the benefit of the doubt. Tianjin's developing underground system took me closer but another MoBike had to be employed, slightly hungover I peddled shamelessly to Tianjin's ancient street. Excusing the rebuilt overcrowded streets I found a side street captured to the left, it gave me something authentic and even Hutong like to hold onto. One of the street sellers dared to call me a 'Laowai' translating to 'alien' I used my Chinese language skills to shock him that I actually had a nationality as he did too! I didn't buy anything, though the incense burners looked nice! Oh, T! Revisiting the riverside along the Hai He, something told me New Year's Eve was going to bring me something that would shake that hangover. Consulting my go-to APP the night before showered me with a monsoon of negativity about what nightlife that may have been in Tianjin I was willing to give those folk one more chance. As the freezing temperatures bit I received a message that took my New Year's Eve into another direction. Finding another kindred spirit from Hubei Province proved it is truly a very small world after all, leaving that cliche behind I found myself neck a scorching bowl of Lanzhou Noodles that weren't the best, I saw the golden arches and in that moment I would have done anything to change those noodles into a Double Cheeseburger! 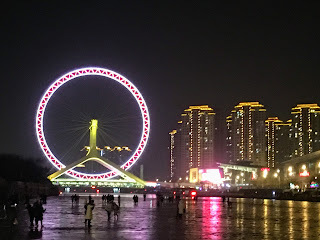 I knew I had to get it together because I wanted to see the Tianjin Eye before the clock stroke midnight! Finding that familiar path I was reunited with riverside, scanning my third or fourth MoBike I tenderly peddled alongside Tianjin's frozen riverfront. Tianjin had already shown me a lot, more than I had planned! Read between the lines T.
Managing to see those purple and red like dazzling lights, I had the Tianjin Eye in my sights. Currently the only 'Eye' attraction in China its something of an attraction in Tianjin but my bike riding view was enough for me! The coldness seemed to feel quite mild, peddling ever closer to the wheel I felt the first stages of 2017 close, I wasn't going to implement any New Year's resolutions because my goals were being scored in that moment. With work I am concurring those mini triumphs that will hopefully become long term realities, I am truly blessed! The chimes of 2018 wouldn't be in a nightclub that night because I was done from the night before, leaving the eye and all of its brightness behind me I walked and then some to the nearest underground station because I certainly don't do buses! Oh, Tianjin Eye please step up your entrance, I saw a hard candy style entrance, look to London for inspiration darling. Advice! Darkened streets fronted me without any concern, Tianjin served safeness in abundance because China has to be one of the safest countries that I've ever been to in my life! Using Baidu Maps I made my way back onto the Tianjin Metro network, arriving back to the familiar sights of Jinwan Square took me back to the beginning. Ditching anymore alcoholic drinks I headed back to KFC for convenience to get a hot chocolate and two egg tarts because I was ready for my bed, I need to get back on that party animal real soon! Ringing in the New Year with a few messages it was back to business the next morning, leaving Tianjin Railway Station for Beijing South Railway Station I had my eye on the prize. Leaving one of China's five Municipalities behind me I knew the chimes of 2018 held big things for me. My snapshot quick weekend gave me great sights and a mad night out, making time for everything it set the pace for 2018 with many new things to experience. Tianjin knew it! China: Rolling On The River!